Here’s an example: Woody is a current Woodpellets.com customer, and his neighbor Wilma is not a customer yet. 1. Woody tells Wilma about the convenient delivery options, the variety of high quality wood pellets available, and the expert customer support at Woodpellets.com. He tells her she’ll love it, and she will get $25 off her first delivery if she mentions his name. 3. Wilma receives a $25 discount on her order. 4. When her order is delivered, Woody’s Woodpellets.com account is automatically credited $25! It’s as simple as that! And another thing…you can use referral credits on top of a promotion. Typically, discounts cannot be combined. Also, there is no limit on the amount of referral credits you can receive. To help make your referrals even easier, print out this sheet of referral cards, write your name on each line, cut them and hand some out to friends that could use our services. Questions? 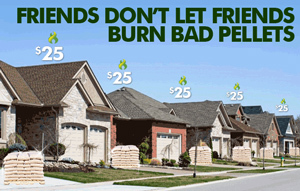 Call the Experts at 1-800-PELLETS!